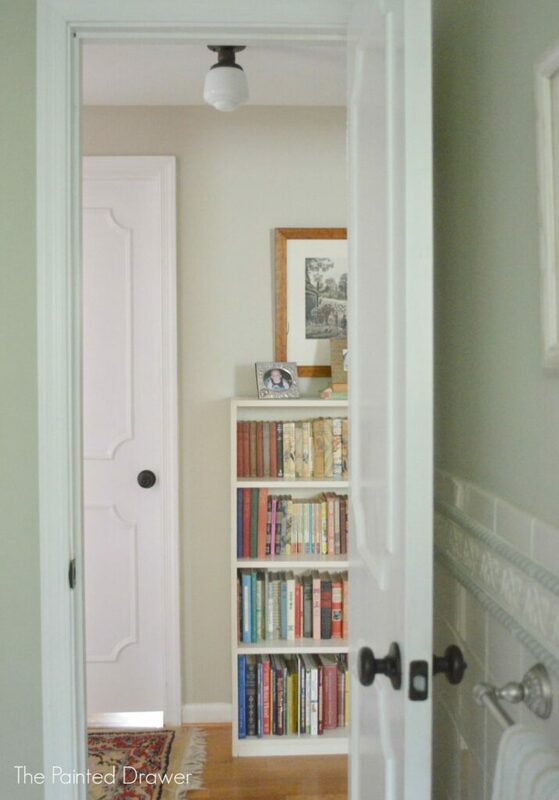 I hope you are enjoying our Shut The Front Door week full of DIY doors! We have more to come, so make sure that you’ve subscribed by RSS or email to get every update! And don’t forget to come link up your door-related projects here, plus tell us a knock-knock joke for a chance to win $25! Our next guest is going to show you a simple but stunning way to make a flat door look like a paneled door, which makes her lovely home even lovelier! The Painted Drawer incorporates a love of design and DIY. It is full of tutorials, thrift store scores, paint and design tips on how to transform your space and incorporate vintage pieces into your decor. The Painted Drawer has become a community of like-minded people who share the obsession of the true “before and after”. The saying A Room Should Feel Collected, Not Decorated is true to my heart and I hope to share this love of eclectic style. My home is my canvas! I share my style (The Dining Room and a Pop of Blue) and also feature simple projects that add a lot of bang for the buck (A Dresser Gone Glam). My most popular post and tutorial was how to transform a dark and dated brick hearth to light and modern by using a whitewash (Whitewashed Brick). Our family room was transformed with this simple and inexpensive project. 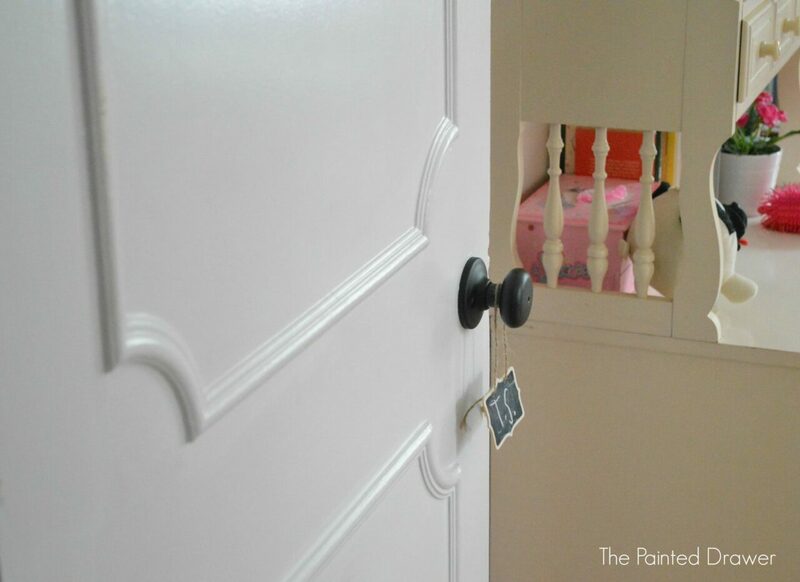 On this post, I’m sharing our interior doors! Here is a before pic of one of our doors.With the addition of molding, they went from boring into doors with character!You can create this paneled look in a cost efficient way with glue and molding that you can find in any home improvement store. If you want to use non-standard molding for different shapes or designs, there are online sites that specialize in decorative molding, such as architecturaldepot.com. Our handyman was an older gentleman who happened to have a lot of molding in his garage stash. He took each door off its hinges, measured and used a miter saw to cut the molding to size. He then adhered each piece with a strong carpenter’s glue. If you or your spouse are handy, then you can easily tackle this project. Just measure your doors, mark out your design and use a miter saw to cut the molding to size. Then apply and paint. It was not a difficult process but it was time consuming. The curved corners made it a little more complicated. If you want an easier version, I suggest creating straight rectangles. REMODELAHOLIC NOTE: For the curved molding, you can purchase flexible millwork moldings (something like this — not affiliated with them at all, just something that came up in our search!) and select a profile that you want on your door. To install, I would recommend creating a “jig” or form to keep the shapes even as you install. Cut some plywood with a jigsaw into the shape you want (to create your jig) and then clamp the jig in place to help you position the flexible molding for one corner while you fasten it. Then you can unclamp the jig and use it for the other corners, so everything will be lined up well. 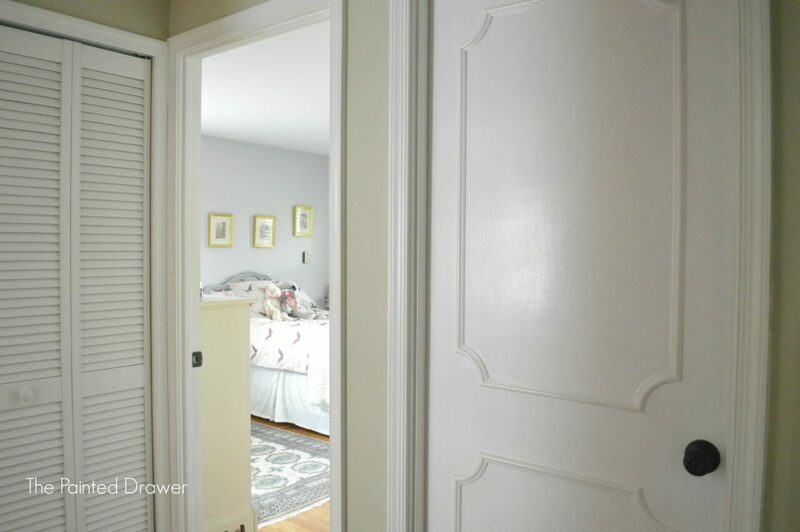 Painting all of the trim and doors a bright white immediately brightened and transformed our space. On the doors, I used a strong primer to seal the original peeling oil based paint and then applied the top coat in Benjamin Moore semi-gloss in Cloud White. Another way I updated the look was to remove the older, gold door handles and replace them with rubbed bronze hardware from Home Depot. We changed out the light fixtures in the hallway upstairs to match. Both were an easy and inexpensive fix. Of course, the second I was done painting, my kids decided to “decorate”…sigh! Thanks for sharing your beautiful home with us, Suzanne! Remodelaholics, be sure to go visit The Painted Drawer for more beautiful inspiration and painted furniture — Suzanne has lots of tips for paint and paint colors and just look at her beautiful stairs! 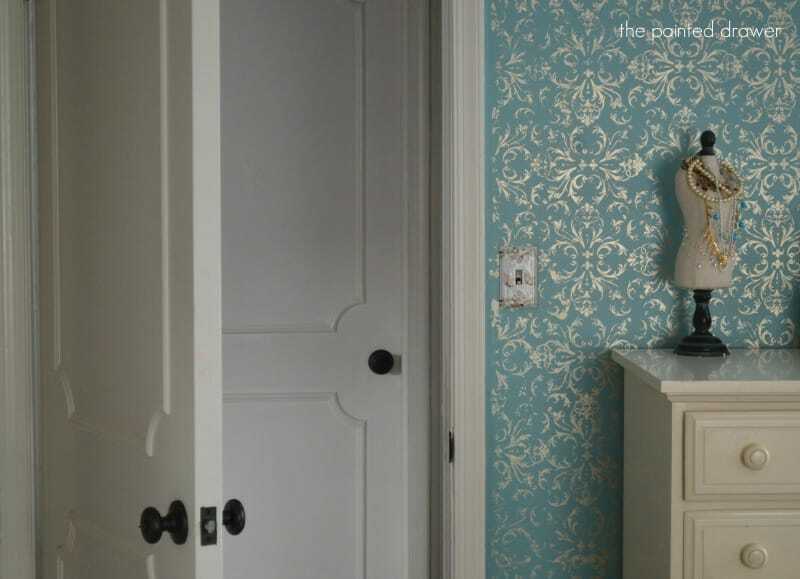 So excited to be featured today as part of this great segment on door makeovers! Thanks so much! Thanks for being part of it, Suzanne! Your home is lovely! 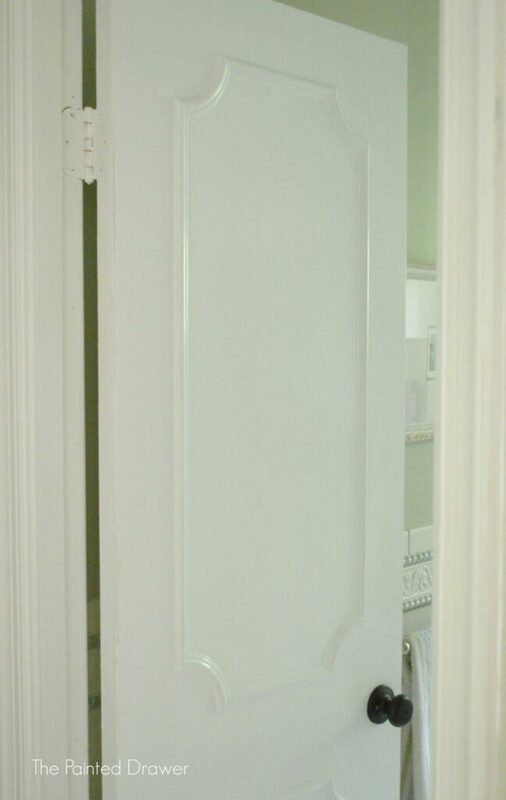 Love the idea, especially because I cant find standard 1-3/4″ thick replacement doors. If anyone is nervous about the flex mouldings you can find curved mouldings here: https://outwater.com/lg_display.cfm/page/M-11/catalog/2016_Master_Catalog . Just need to miter the corners.